* Prices are for our Castlemaine manufacturing facility. Prices subject to change. For other locations, prices may vary. Secure your place in our trailer manufacturing queue by making a 100% refundable deposit of $995.00. Delivery of your trailer is an additional charge of $1.95/km round trip to your location from the manufacturing facility. For interstate pick up from Castlemaine, we offer a free overnight stay in our Fossil Fuels Free Off-grid Tiny House availability permitting. Our length measurement does not include the drawbar. Add 1.5meters for the drawbar. The style of tiny house trailer is either “protruding wheel guards” or “flat top”. The ATM of your tiny house trailer is established at the time of manufacture as the maximum load carrying capacity in kilograms. The ATM cannot be changed or added to once built, because all the components that make up the trailer (e.g. tyres, brakes, bearings, suspension, coupling and chains) are all rated to meet a minimum ATM of 4500kg. Comes in a 70mm ball coupling to accommodate 4500kg ATM. Our trailers come as either 2 (tandem) or 3 (tri) axle sets. A 7.2M long 4500kg ATM protruding wheel guard style tiny house trailer has an “uncompressed” trailer floor to ground height of 680mm. You should use this measurement as a trusted guide and starting point for designing your tiny house up to the legal maximum allowable height in Australia of 4.3meters from ground to the highest point on your tiny house. See more about “Anticipating the highest point of your tiny house” in the sub-section below. The trailer floor to ground height measurement we give here is for an uncompressed leaf spring suspension. This height is the distance from the ground to the steel floor of your tiny house trailer without a tiny house built upon the trailer. As you build your tiny house you will be adding weigh to the trailer and the leaf spring suspension will compress, bringing the trailer floor closer to the ground. The finished trailer floor height above the ground will be less than the uncompressed suspension height, but by how much depends on many factors, including your overall weight and the performance of any given set of leaf springs. Making it hard to predict the finished trailer floor to ground height. So we like to play it safe, because if your finished tiny house ends up being over the legal height limit of 4.3meters it will not be registrable in Australia. And being un-registrable will not only reduced the re-sale value of your tiny house, it might also create problems for you down the track with local council who could rightly claim that your THOW cannot be classified as a caravan, because it is not registrable as a caravan. 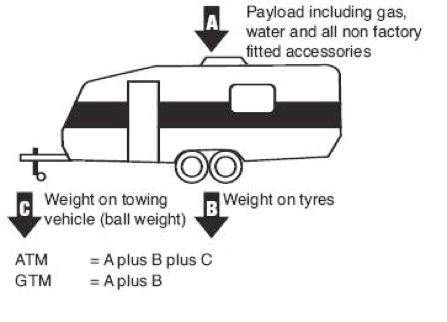 An oft overlooked dimension of a tiny house trailer is how much height there is between the top of the tyre and the bottom of the wheel guard. The big question to answer is, “How much space to allow for the compression of your suspension as you add weight to the trailer?” We like 150mm gap for an uncompressed suspension. The distance from the top of the tyre to the bottom of the wheel guard is a critical dimension of your tiny house trailer and one that does not get near enough attention. Because it is a distance that gets fixed when your tiny house trailer is manufactured it is very difficult to correct and the consequences of getting it wrong are profound. Damaged tyres, damaged wheel bearings, bent axles, even a fire or a road accident are all possible if these two surface make contact at high speed. Long term, if you ever want to sell your tiny house an inadequate clearance here will diminish it’s appeal to the discerning buyer. Traditional trailer manufacturers give about 100mm of clearance. But we’ve seen too many issues with tiny houses tyres kissing the underside of the wheel guards to simply go along with conventional practice. We design in a 150mm clearance on all our trailers styles for this critical distance. While designing your tiny house it can be tempting to focus your attention entirely on reducing the floor height of your trailer. Maybe you’re tall and this is a big concern and that’s fair enough and totally understandable, because the lower you get the floor then the more head height you’ll have in your bedroom loft. But to get this critical dimension wrong is to loose sight of the bigger picture which is first and foremost you are building a road vehicle that is safe to tow. Anticipating the highest point of your tiny house is crucial to making your THOW registrable as a road vehicle in Australia. That highest point could be your roof’s ridge cap, or it could be your solar panels, or your chimney. It all depends on how you design your tiny house. Don’t worry, because we will walk you through the things to look out for as part of the DIY support we offer with each trailer purchase. Starting your tiny house build with a thoughtful, conservatively designed trailer (i.e. trailer floor to ground height measurement) will give you the peace of mind that your final tiny house will end up being below the legal height limit of 4.3meters, legally registrable on Australia roads and your wheels with spin freely and safely no matter how rough the road! as well as the mass imposed on the jack stand when disconnected from the tow vehicle (C = Mass on Tow Vehicle). Not to be confused with the GTM (Gross Trailer Mass) which is only A+B. ATM v.s. GTM Illustrated. ATM= A+B+C , while GTM (Gross Trailer Mass) = A+B.